As a senior at Bryn Mawr, Francis Ayers ’04 found a way to incorporate her love for fashion into her studies by completing an Edith Hamilton project entitled, “A History of Handbags: The Power of the Purse.” After graduating from Bryn Mawr, Ayers enrolled in the College of Textiles at North Carolina State University. During her junior year, she earned an internship at Ralph Lauren in New York. The internship was so successful that Ayers was offered a full-time job after she graduated, and she is still with the company. I have always loved turning the ideas in my head into real things, whether that is a craft or knitting project or sewing clothes. When I started looking at colleges, I knew that I wanted to go into fashion, but I was not ready to go to New York City. I enrolled in the fashion design program at the College of Textiles at North Carolina State University. It was there that I learned about the internship position available at Ralph Lauren. I went to New York City to interview and spent the summer after my junior year as an intern in the men’s sweater design department. They offered me a job after I graduated from college, and I have been there ever since. The most surprising aspect of my work has been seeing how global the corporation is, from the thousands of retail stores around to world to the yarn vendors from Italy, China, New Zealand, Scotland, Peru, and Egypt, with whom I work daily. There are factories in the U.S., Hong Kong, Scotland, and Uruguay. It always amazes me to be in constant contact with the rest of the world. For the 2014 Winter Olympics in Sochi, Russia, my team worked closely with Mr. Lauren to design clothes for the athletes to wear at the Opening and Closing Ceremonies, as well as in the Olympic Village. We made a commitment to make everything in the U.S., from domestic resources, which made the process really long, but also exciting. 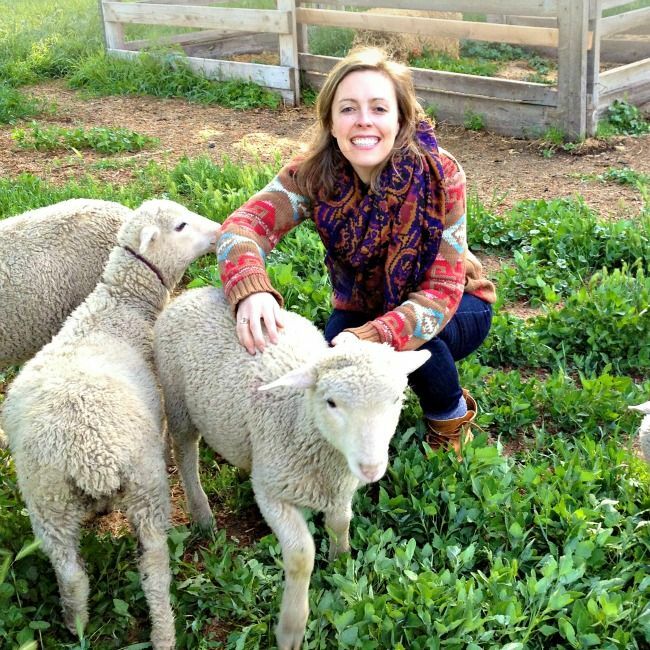 I spent a year and a half visiting sheep farms in New York, Michigan, Nebraska and Oregon, trying to find the perfect wool for the sweaters, hats and scarves. In addition, we had to find sweater factories that could handle the production. That was the hardest part, because many domestic mills and factories have closed in the last 15 years. My favorite part of the process was visiting the farms, especially the Imperial Stock Ranch in Oregon; we chose their wool for the Opening Ceremony sweater. Our partnership with this ranch was so special, and their story was so inspiring, that I spent 10 days making a short film entitled, “The making of the Olympic Sweater.” That’s me in the first scene, sketching the uniform. I use the things I learned at Bryn Mawr every day, especially the math and science fundamentals. We use science for fixing dye formulas, washing the garments to make them softer and for blending different types of yarns, such as wool and cashmere. Math is used to ratio portions of a sweater to fit the body, and to estimate how much yarn to order for production. It takes an incredible amount of time, work, and manpower to create one piece of clothing. From gathering research and brainstorming ideas to sketching, fabrication, translating the design to the factory, fitting the garment and making changes, it takes about a year to get a final product on store shelves. I love what I do, and I am grateful to my advisors from Bryn Mawr, who guided me and inspired me to do what I love.